The nearest place we could find for me to stay south of Ostia was Anzia. Too far to make it on a Friday in time for the Sabbath so I stayed in Ostia. I read that there was a synagogue in Ostia, so on Saturday I set out to find it. It was in the old city, which was separated from where I was staying by an hour and a half walk which included a section of non pedestrian friendly highway. Had I known I wouldn't have gone, but by the time I was walking along the edge of a highway I was almost there. As it turned out, the synagogue, being an archaeological ruin from the first century, was on a dig site that required an admission fee, so no services for me. Oh well. Saturday night the club was throwing a party for the president. He had just returned from an attempt to cross from Africa to America on an extremely small double hulled sailing boat, no cabin. Had he succeeded he would have been the first, but far out in 30 knot winds his boat went over and his mast broke. He activated his EPIRB and was picked up by a freighter. Sunday was a bad weather day. Today I paddled to Anzia. The vice president of the club came to see me off. While making my beach launch I waited for a lull in the waves, and then put my boat down so that I would be taken out to sea when the waves picked up again. Hopefully by then I would have my sprayskirt on and be ready, but it was not to be. The VP, noticing that I was sitting in my boat on the sand messing around with my skirt thought that I needed a hand and gave me a shove off. It was nice of him to try to be helpful, but without my skirt ready I took on a bunch of water while pushing through the breaking waves. Oh well. Once out I tried to lower my rudder. It wouldn't come down, sand must have gotten stuck in it. 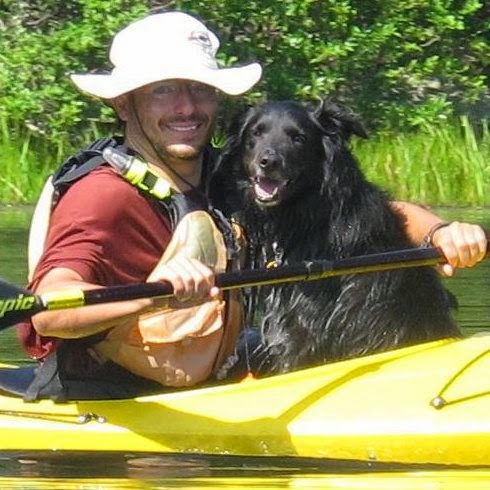 I paddle fine without a rudder, but I paddle faster with one. There were twenty miles ahead of me, I wanted it down. Not excited about the prospect of another beach landing and takeoff, I sat and thought. With the sun shining wonderfully I decided it was perfect weather for deep sea style repairs. I set up my paddle float and began inching my way onto my rear deck towards the very end. While the extra stability from my paddle float was enough to support my shenanigans in the center of the kayak, as I got to the end, the deck of the boat began to drop below the surface of the water and the kayak began to take some water into the cockpit as the bungees failed to sufficiently hold the makeshift outrigger in place. In other words, as such, my plan wasn't working. I rolled off the deck into the water. It was cold, but not unbearably so. If all went well I'd be back in my boat in no time. I positioned myself next to the rudder and tried to pull it down. It wouldn't move. I don't keep much gear on my deck, but I do have pliers and I put them to use. The rudder was down in a moment and I climbed back into my boat. Lessons learned, inflate both sides of the paddle float and not just one, attempt to wedge the paddle under the non bungee deck lines, and extend the paddle to its maximum length for best results. Back on my way I was cold, but soon warmed up with the exertion of paddling. Late in the afternoon I passed some ancient ruins. I think I'm learning to distinguish between middle age ruins and Roman ruins, but I'm not sure. Anyway I thought that these were Roman. Aside from some dilapidated structures, there were large caves through a peninsula cliff, allowing one to look through it to the other side. It was cool. As I entered the port in the evening I passed the usual group of fishermen. I couldn't help but think bad thoughts at them, which probably makes me a bad person since it is unlikely that these are the same fishermen as the dozens of others who have done me harm on this trip. Tonight I'm staying with the welcoming LNI here in Anzio. A couple of days ago I tried changing the batteries in my waterproof headlamp. Salt water had gotten in and dissolved the inside pieces. It fell apart when I opened it. Wednesday I ate breakfast, got ready to paddle, and puked. It looked like it would be another bad stomach day, so I sat in a comfy chair, watched Pulp Fiction among other movies on my computer, and managed to avoid moving unnecessarily for the next 24 hours. In the evening I forced myself to eat, which wasn't easy. Day 58 was a force to be reckoned with. The plan was to kayak from the Lega Navali in Santa Marinella (42.036273,11.87223) to the next Lega Navali, in Ostia(41.718111,12.301828). It would be a distance of about 30 nautical miles of coast, and on account of a strong headwind, I would be sticking close to the coast. Even on the coast, though, my progress was slow. Moving into the headwind and the oncoming surf I passed by waterfront towns in the outskirts of Rome. After a nature reserve I heard shooting above me. It wasn't the first time; I also thought I heard shooting next to the airport in Genova. I didn't think anybody was shooting at me, they say that if a bullet passes very near you, you can hear it whiz by. While I have been shot at plenty of times,* I've never heard the whiz of someone aiming for my head and just barely missing. Either way, no whiz, no visible shooter, I figured I'd be fine. The Military dressed man on the beach who stopped me probably didn't think so. I brought my boat as close as I risked and he told me I couldn't paddle any further. I parked on the beach and got out. A sniper was practicing in a range and the coast was closed five miles out. I guess he wasn't a very good sniper, if they were worried he might accidentally hit passing mariners up to five miles out. No, I was used to such rules, there are plenty of them in Israel. I waited about half an hour and then was back on my way. There were a number of places I passed on my way and at each one I considered whether or not to stop. I was expected in Ostia some time between 7:00 and 9:00. If it looked like I wouldn't make it in time, I would stop, call ahead, and finish tomorrow. 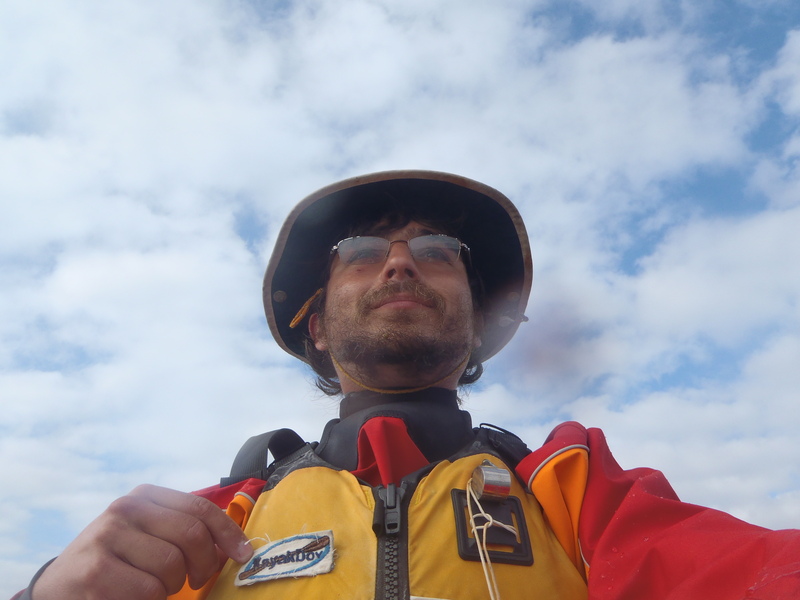 To stay out of the headwind I was paddling very close to the beach. The closer to the beach I got, the less current and headwind were against me. Considering this, and how many times before I've been in the same situation, it's strange that I hadn't until now accidentally washed up on shore. It was annoying. With my starboard side to the beach I was not at all in a position to launch. I tried anyways, and hopefully didn't lose to much of the finish off of my bow. With what my boat has been through, the finish has probably been gone some time now, so I can rest easy. In the afternoon when I had my last chance to stop for the day, an expected good thing happened, my headwind turned into a tailwind. At a decent speed I moved slightly away from the coast and began to cut straight across to Fiumicino where I passed the mouth of the Tiber at night. I looked up its wide banks and saw lots of lit up buildings on either side. It may be the largest river mouth I've passed yet, but I'm not sure since it's been a long way. The other noticeable thing about Fiumiccino was the airport. There was never a moment when a plane wasn't taking off, one big commercial jet after another. Paddling in the dark I found a seawall ahead of me and followed it away from land, only to take another turn at what seemed to be the top of a “C” heading back the way I had come. Had I accidentally moved into a port without realizing it? I hadn't noticed any navigational lights. I was almost at my destination, or so I thought, and it was frustrating to be backtracking, looking for a way out to sea around the wall. The light from the city blinded me and I had no idea how long it would go on for. I shut off my own green/red light to allow my sight to improve slightly. Finally, I turned a corner and was headed back in the right direction. Interestingly, a look at a map shows the area to be nothing like I perceived it at night. Fortunately, keeping the mainland on my left is easy enough even when depth and angle perception are completely thrown off. Finally my GPS had shown me that I was there. I got the coordinates from the previous Lega Nevali, and thought that maybe I could make out the masts of sailboats just beyond the rise of the beach. I had also seen it on a map, I was fairly certain I was in the right place. A good thing too, because it had been a long day. A couple of fisherman were fishing off a seawall and I checked with them just to make sure. They told me several things, among them, that I shouldn't be paddling at night and that there was no Lega Navali here. “Are you sure?” I asked. Yes, they were absolutely certain, I would have to paddle for another kilometer. Huh. I must have gotten bad coordinates. Maybe this was some other boat club, my host for the night would be waiting at Lega Navali, not here. It was 9:00 in the evening. I paddled on, past industrial places, storage houses, and beach bars, all dark in the night. Finally, after about a kilometer and a half I saw an inviting beach that might have had some small sailboats parked a little ways up it. I stopped and got out. Wet, cold, and exhausted I dragged myself and my boat up the beach. The small sailboats I saw dissolved as phantoms. I found a walkway that brought me past many small buildings, unlocked. I couldn't make out much inside of them, but I was very cold and the small room would be a refuge. The building that I thought was the L.N.I. tuned out to be restaurant that was closing. I asked if I could leave my boat there over night. “The Lega Navali isn't far, about a kilometer back the way you came.” I was told. I put in what felt like it ought to be a post-last effort. I paddled back the way I came. I came to a building on the beach that was toop dark to make out. A flag flew above it, a flag that might have had the “L.N.I.” on it. While I was thinking about it the surf surprised me with a short fight. I think the thought was that I was as beat as I looked. I didn't want to risk another wrong guess. I figured either this was it, or the fisherman was wrong and my GPS position was right. I didn't want to do another beach landing and relaunch, so I paddled back to my GPS position. The land was right as I had seen it on the map, maybe I had been shown the wrong place. I got out and climbed a very steep beach, stumbling and falling over myself and the sand. From the small hill I could see a field of light double hulled sail boats and a building with people in it just beyond. With great effort I got my boat next to one of the others. Covered in sand and so tired, I wished I was a weaker man that I could cry, I found myself in a bar in the building asking if I could just sit there for a while. It was the Lega Navali. The fisherman who told me it wasn't was the devil, come out to try to put a stop to my trip in the night. I'm so close to finishing. The people of the L.N.I. were super nice; after a shower I found myself in a room with a couple dozen or so, finishing up a meeting. When I walked in, they all applauded. I guess I deserved it, after all, I fought with the Devil and survived. Yesterday I paddled the short distance to Santa Marinella since the next Lega Navale is in Fiumicino which was too far. Today I had intended to paddle there, but I woke up with a bad stomach, probably on account of some cheese I ate last night that I picked up in Rome. To lose the contents of your stomach on the water is to lose all your energy, so I thought I had better take the day off than risk it. 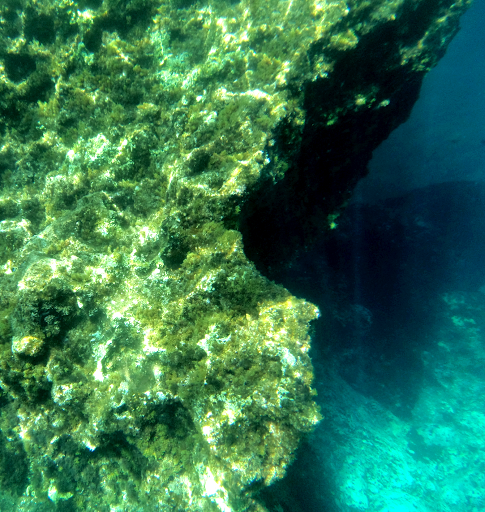 The weather was sunny and the water so clear I could see the sea bed as much as 20 feet down. It was a nice afternoon. I thought I saw my first dolphin of the trip, when a black spot came quickly out of the water and then back down near a buoy. My experience with dolphins is that they won't come up just once, but are constantly surfacing and submerging. I kept my eyes open to catch it again, only to find a diver in the same spot. I had seen his flippers pop up for a moment as he swam down. Finishing with the warming sun still in the sky I decided I would practice a couple of rolls. If my River People dry top and NRS spray skirt were quality then I would have stayed almost completely dry. But even with my neoprene cap, I got wet while under and was very cold when getting out of my boat. The water is getting cold. I was welcomed at the entrance to the harbor and made to feel at home in the Lega Navale here. 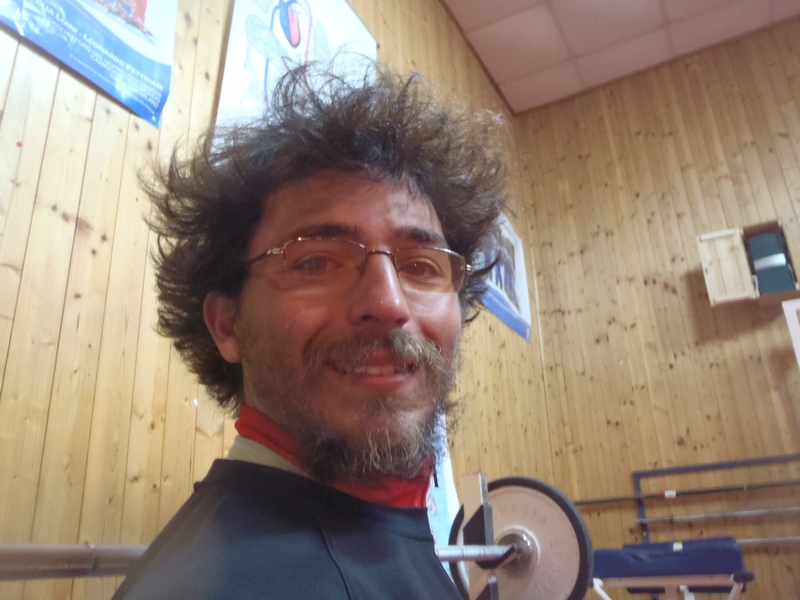 Yesterday I finished the paddle to the Lega Navale in Civitavecchia. I had accidentally told them I would be there last Wednesday, when I meant Thursday, but was running late and with a two day break in Rome only arrived this evening. What was Rome like? I can only say that I may not have had the properly reverent attitude when passing the tombs of the popes who oversaw the crusades and the inquisition. We were looking for the one behind the expulsion from Spain or he-who-was-pontiff during WWII, but were ushered out of the hall before we could find them. The other interesting thing we noticed in the mausoleum is the number of popes who presided for two months or less. There were a lot. While a more empirical data set would be necessary, I suspect the conclusion would be the same as my conjecture. Many popes died before their natural time, or that one is more likely to be selected pope if he is in extremely poor health. I wasn't on the water until about 1:30 p.m. There was a wind that was sometimes helpful and sometimes not. A little farther out to sea it would have been a strong wind, but I was within a few meters of the beach almost the whole day. Most of the land was wilderness, woods or salt marshes. Sometimes the trees would rise up high and at others they would be low scrubland things. I saw a bird on the beach that had long legs, a long neck, and a long beak. It was trying to find shallow water to stand in, but had to move on every time a wave would come. I think it was somehow in the wrong place. The wilderness ended and as night came I was paddling along a giant industrial plant that stank of sulfur. Soon after I crossed a huge port that was designed for big boat traffic. I kept my eyes open for anything that was too big to see me, but the water was quiet except for the occasional night fisherman. Paddling along a seawall there were lots of fish around me, more than I've seen yet, splashing around the water and leaping out of it. There was a big fish, about a foot and a half long that leaped out near the front of my boat, and thudded into my bow hull just under the water line. My kayak shook. I put my lure back in the water and before long was pretty sure I had caught something. Anxious to end my day, I decided I would leave it there and deal with it when I pulled into port. Blinded by a powerful light just above the water I went over some shallow rocks that I otherwise would have seen. I shivered as my hull crunched over them knowing that another ugly scar would mark it. A minute later my reel popped out from under the bungees. I pulled my line in and found that I lost my lure and whatever tasty treat might still be hooked on it. There were bioluminescents. Little tiny sparks would spill off my paddle, or jump out of the water just behind them. Farther away when a fish would leap, his landing would be marked by sparks bursting up after it. It was a little bit of magic next to an industrial port. Finally I pulled into the smaller port I was looking for. I had saved the position on my GPS, and it's a good thing because their navigational lights weren't working. In the darkness I didn't see the harbor until I was only a very short distance away. The president of the Lega Navale Civitavecchia was extremely welcoming and made me feel like a visiting lord. He told me that the purpose of the Lega Navale was to help those doing awesome trips like mine, and educate youth about the sea. Here they take kids out windsurfing. The goal of education is a wonderful one. The sea covers most of the globe, and its health is a good indicator of the health of the planet. Right now the sea is not healthy, coral reefs are dying, water is rising and too warm, fish have poison in their livers, and overfishing is devastating natural habitats. It's nice to know that some people are still fighting. I slept last night on a boat in one of the oldest Roman harbors. The port is surrounded by ancient walls and battlements. Last night I posted the exact position of my kayak on the blog. It is unusual for me to do this for security reasons, however, I was feeling generous. This morning I had my night things in my duffel bag and was making my way towards my boat. Their was a coast guardian near my boat, possibly waiting for me and possibly minding his own business. I was best off avoiding the coast guard, so far they had only caused me trouble. To get dressed and prepare my boat for launch I would need at least a half hour with it. A distraction was in order, how could I get the coast guardian away from my boat for half an hour? Arson, I would set fire to one of the other boats in the harbor and then quietly be off. On second thought, I had probably better face my fate, I could even hope he wasn't waiting for me. “Is this your boat?” He asked me. “You need to come with me.” He said. Rats, what had I done now. He went on to tell me that he had been waiting by my boat all night. “No problem, that's my job.” He said kindly and professionally. I met the captain of the harbor and we came to the following understanding. I would call a free number for the Italian coast guard search and rescue (SAR) force every night and tell them my position. The coast guard had gotten wind of my trip the night before. They had also come to the understanding that I was lost at sea and launched two boats and a rescue plane some time around midnight to recover what was left of me. I learned later that this was partially my fault, I had arranged to meet the Lega Navale in Civitavecchia a night earlier then I had realized, and when I didn't show up at the prearranged time they informed the coast guard. Sorry. I set out in a straight line from Porto Ercole to Montalto Marina. I checked the weather and was expecting a mid level wind, that might have been a little helpful, especially in the afternoon. In fact it was a straight on headwind. I stopped for one of my breaks (42.360573,11.34613) and found that I was moving back the way I came at two knots. 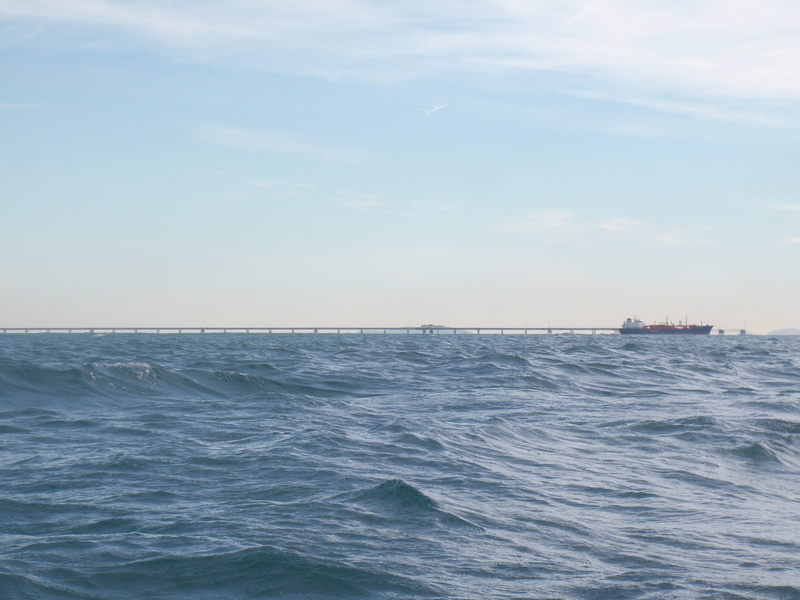 I decided to cut straight towards land hoping that the wind and current would be reduced there, even though it was over a mile out of the way. I was hoping to make it past Montalto Marina so that I would have a short trip on Fridayto Civitavacchia, but instead I arrived late. The harbor there, the mouth of a river, is small and barely developed. I saw only one other boat on the water next to a high seawall and took mine out at a ramp. About a hundred meters away there was a small gated and locked yard with boats in it. The yard was next to a house so I knocked on the door to ask if I could leave my boat there. The man did not own the yard, or speak English, and told me I would have to wait until tomorrow. I wanted to go to Rome for the weekend, my parents were there visiting, and I wanted to leave that night. So I climbed over the gate with my kayak, hid it in the yard, and made to leave when the man was out of the house again and yelling at me. He knew I had put the boat in the yard because it wasn't where I he had seen it earlier, but the kayak was hidden well enough so that he couldn't find it. Angry and confused he went at me in Italian, and finally got really mad at me for not understanding him. Eventually he stormed off. I called the coast guard number to tell them where I was and that I wouldn't be paddling until the weekend. The man on the other end of the line was not only happy to talk to me, but was able to give me train information. That was really nice. Hopefully I will continue to enjoy a more positive relationship with the coast guard, and find my boat where I left it when I get back. Why is it so important that I get back to school that I can't finish my trip? I posted some of Dov's blog entries out of order when I overlooked the original days 50 and 51. I've put everything right now, I think, but I have inserted new entries for days 50 and 51 and renumbered the subsequent ones accordingly. As they say in Italy, mea culpa. 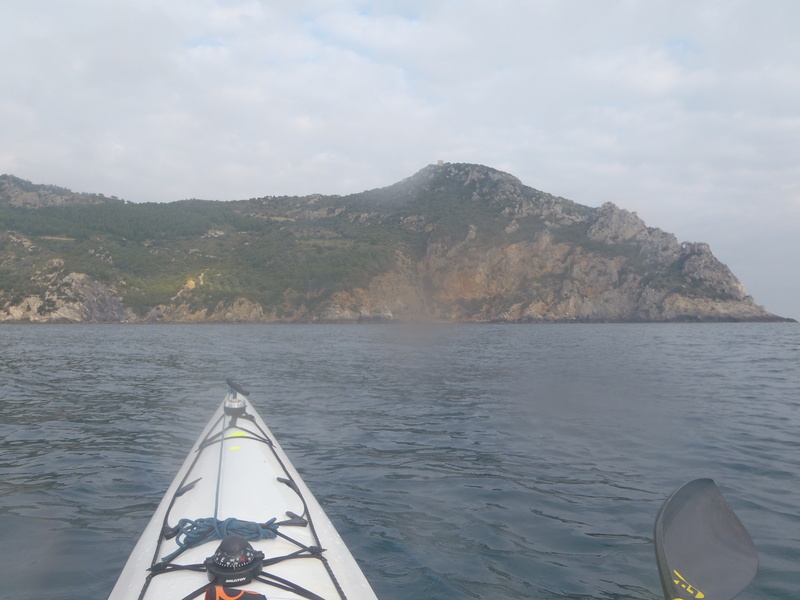 Today I paddled from Porto Stefano to Porto Ercole. I intended to go much farther, but I was beat. I don't know why, but I couldn't paddle five minutes without wanting a break. Argentario used to be an island, roads now connect it to the mainland making it a big peninsula. It's an amazing place. 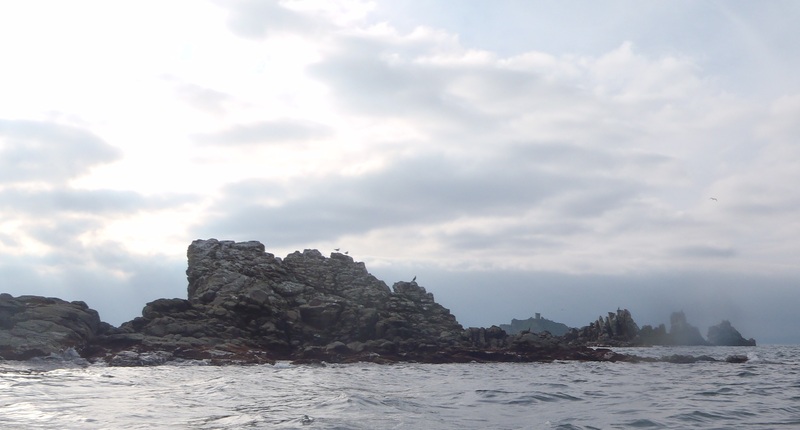 The usual fantastic woods, small islands just offshore, mighty cliffs, and deep sea caves. Today I paddled into my first sea cave, large enough to get my entire boat in with plentyof room to spare. I had a look around the cavern. The water was calm, clear, and a lighter shade of blue. The ceiling rose high above me and from the center, I could see just about all of it. There were two entrances. On my way out I sang, adding "explorer extraordinare" to my list of attributes. An old fisherman was talking to me from his boat and I told him I didn't understand Italian. That didn't stop him. He went right on telling me things. I was worried that he was trying to warn me of some fatal danger ahead. Instead of dying, I caught a fish. I had it on my line and tried to pull it in. I couldn't, it wasstuck on my rudder. I dragged it behind me until I could pull over. There were seagulls flying overhead so I tried explaining to them that it would be very rude of them to take my fish from behind my boat. Since this had little effect I tried yelling like a crazy man. I finally found a tiny private port to pull over in. I straightened out my fish and spoke to the men working on the house above. All I needed for the night, and I was ready to call it a day, was water. I would ask for water and permission to sleep by the small dock, tell my story, and hope for greater hospitality. The man working on the house said that he could not give me water because he was just working there. He added that the owner of the house was the queen of Holland and was not home right now. At least, she was not in this one. I got back in my boat and paddled some more. I kept the fish in the water along side theboat hoping this would keep it fresh. When I got to port, steering clear of coast guard run Capianteria, I found the yacht clubclubhouse and asked if I could sleep there. The answer was no. There were a few old guys seated outside talking, so I tried standing around looking pathetic for a while. One of them pointed to a large fishing boat and suggested that I might be allowed to sleep there. No thanks. I went back to my kayak and began setting up for another evening of sleep-in- hiding. A boat pulled up and the man aboard spoke English. We chatted as he disembarked and closed up. I showed him my catch of the day. He looked at it and said he caught one like that too. He used as bait for this. He held up a giant red sea monster, at least a hundred pounds. He brought it up from a depth of a hundred meters. Tokyo can now rest easy. He also mentioned that there is a Lega Navale* here in town. I followed his directions to a man who said that I could sleep here. Let me use the internet, and gave me that which I treasure above all, a welcoming smile. The Coast Guard ports in Italy are unfriendly places of motor bureaucracy. Lega Navale Italiano is company of men and woman who are making the world a better place, one boat at a time. * The Italian Yacht Club ~ ed. Special thanks to the good people at Epic. Their customer service, in quickly and without charge replacing my epic paddle is first rate. Thanks Epic. I spent the Sabbath with the Jewish community in Florence, the city where they found the Renaissance. The synagogue is big and about 150 years old, give or take a few decades. I was walking around during services looking things over. I was up front near the elevated Torah porch, when a man wearing a black hat started hissing and grunting at me, waving his head, that I wasn't allowed to be there. Once I was sure of what he was saying, I gave him my own “bug off” face. I don't respond to grunts and gestures, and I don't take orders from people who haven't introduced themselves. * As a Jew, I won't be told that I'm not allowed to be up front in a synagogue sanctuary, even if I do look like a bum. It turned out the man was the rabbi. On Sunday I arrived at my kayak too late in the day to make any real progress, so I decided to do some work on my boat. I have been meaning to attach bungees to the top of the cockpit making a shelf for my rockets. Armed with super glue, I managed to attach them to my fingers, but not the Kevlar lining. It wasn't a prophesy of doom and destruction like all the famous prophets had, it was more my style. It's not that I'm saying I'm a prophet, I'll leave it to you to read what happened and decide. However, if you don't come to that conclusion, know that you're wrong. I woke up this morning with one line from a song in my mind: “the girl with kaleidoscope eyes.” It was there and it was strong so I sang out loud as I walked to the marina's offices to get a weather update and ask them to call ahead to arrange a place for the night. There she was. At the desk, was the girl with kaleidoscope eyes. She was beautiful, and enthusiastic, and friendly, and helpful. Her eyes were amazing. Here's an excerpt from the conversation. “So why are you doing this trip?” the girl with kaleidoscope eyes asked me. “Yah, for me it's really easy.” She said. Rats, I would need to come up with another way to relate the idea. At any rate, she gave me her contact information before I left. “You are not only the most helpful secretary I have met, but the prettiest.” I told her. I paddled from Marina di Grosseto to Porto Steffano. The beginning of my trip took me along a mostly empty beach. There were piles ofwashed up pieces of wood and debris. A golden lab was out for a walk and saw me. Intensely interested he was clearly considering swimming out to get a closer look, but a man nearby told it not to, too bad. The man said something to me in Italian and I said “Ci” and smiled. The man said something else, and then seemed to understand that I'm an idiot and stopped talking to me. I also saw a man on a chariot being pulled through the water by a horse. As I made my crossing to the peninsula, I felt a tug on my line. I caught an old piece of plastic. I passed through a garbagy area, uchh. Finally I pulled into an extremely large mostly empty port. I was paddling alongside amotor boat and called out to him asking where the capitaneria was. He couldn't hear me over the sound of his motor and told me so. I tried a few more times screaming, and eventually, rather then turn his motor off, he started to ignore me completely. There are frequently castles above old ports, and I always think it's cool. This port, like many others in Italy, is run by the Italian Coast Guard. I asked in the captain's office if I could leave my boat in the port over night. My boat was parked on the opposite side, about a 15 minute walk away. The answer was simple, I could not leave my kayak anywhere in the port area. Finally after much deliberation they showed me a beach just outside of the port where I could leave my boat. It was the sort of spot that shouted “Please steal anything you see here.” I said no problem thinking that my boat was just fine where it was, surrounded by mid level yachts. “What about there?” I asked pointing to a small storage shed. “It's locked.” The coast guard kid said. “Who has the key?” Locked shouldn't be a hard problem to solve. I checked the door. It was held shut with a chain lock. It would be easy for me to squeeze through. He said something to me in Italian that I didn't understand. At the end of his comment he put his hands together at the wrist, as though showing handcuffs. I didn't believe he was being so rude. “I don't understand.” I said. He could have just said from the beginning that there were regulations against it or something, instead of the bit about it being locked. Either way, I solved the problem by shoving him into the harbor and kicking seagull poo onto him. Spectators cheered and declared a holiday in my honor. Meanwhile, today I lost my spoon between the floor boards of the dock, I could see it beneath so I got out my screwdriver to take up the boards. ** Unfortunately the screws were too small. I still have a fork though. Until now, it's been virtually unused. * Or anyone else. ~ ed. ** Wouldn't it have been easier to find a new spoon? ~ ed. 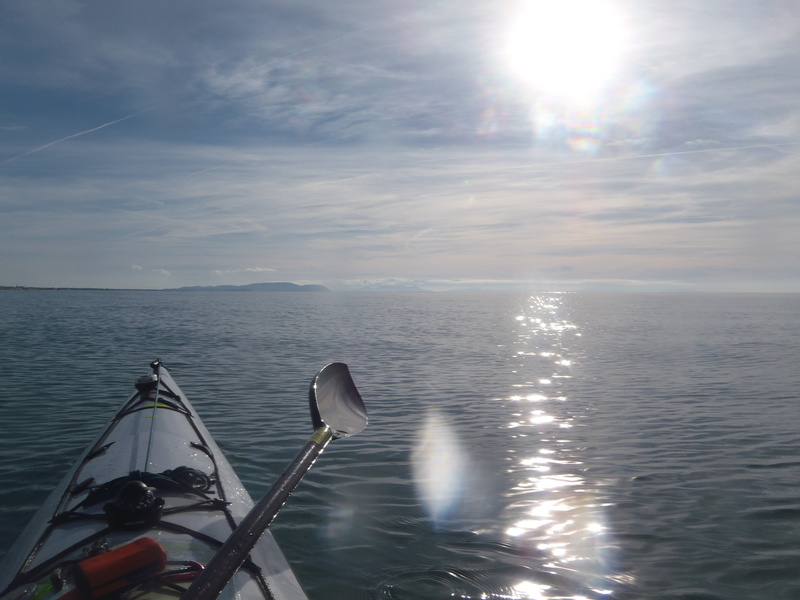 Today I paddled from Piombino to Marina di Grosseto. I had fought a fish on my line but it got free. A few hours later I caught a fish. The fish I caught I kept on my back deck. It would flap occasionally until it stopped.Catching fish is depressing business, I hope that adding the fishes strength to my own will do it justice. I arrived in the marina hoping to meet the Lega Navale people there. My host from the night before had arranged for the someone from the Lega Navale of Marina Di Grosseto to meet me. It turns out that there is no Lega Navale in Marina Di Grosseto. The port has allowed me to keep my kayak here but will not help me find a space of floor to sleep on. This morning I bought a chart. It's not waterproof so I won't be able to keep it on my deck but it's better than nothing. I also picked up and ate a couple of bars of chocolate, and that's the closest I get to high. Please consider this in your reading, should you be so brave. The day was bright and the air fresh and warm. There was no wind to speak of and hardly a cloud in the sky. The weather was perfect, better than perfect. It was as though Mother Nature was flirting with me. “So, when do you get off?” I asked casually. The sun smiled and the sea blushed extra blue. She was into me, yoww. 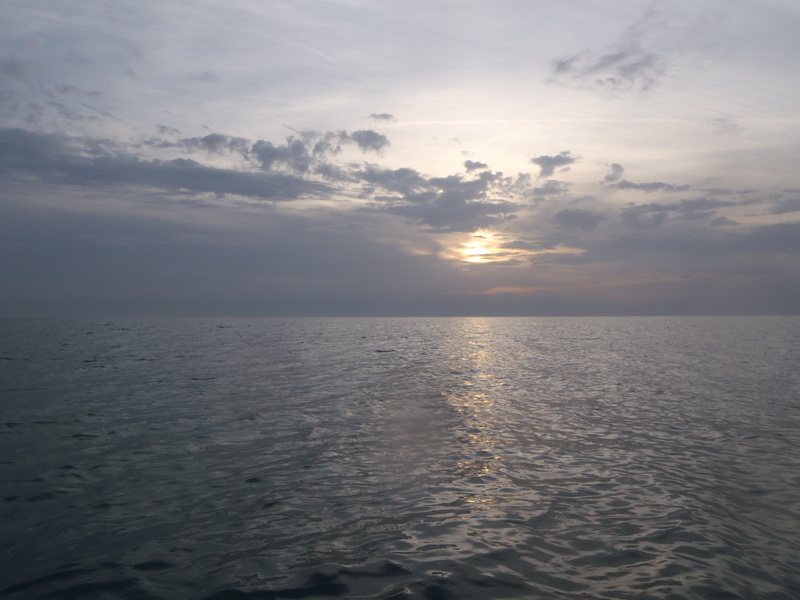 In the morning the water was glassy flat and tiny gentle swells caressed the side of myboat. Sea gulls flying overhead squawked sweet nothings at me. Occasionally, I would casually glance at her pretty Corsica. I think she liked it. I couldn't help but be overwhelmed with the pleasantness of it all. In the afternoon she blew me a soft breeze from behind so I doodled my boat along the swells of her sea. We saw a couple of swimmers out enjoying the weather as well. They were the first I had seen since the summer. They didn't last very long in the water. Shortly after we passed three kayakers going in the opposite direction. I said bonjourno and they said ciao, but didn't seem inclined to chat more. It was just as well as my attentions were devoted to my lady. In the afternoon she showed me a forest that came right up to the beach only a few feet from the sea. It was amazing and went on for miles, if only I had met a girl that could do that years ago. Time flew and I reached Marina de Cecina well before I was ready to call it a day. The nice people at the Lega Navale in Livorno told me that they would be unable to help me find a place for tonight. The great mooring man that I met yesterday asked me where I was going today. In the end I arrived a couple of hours earlier than I said I would but a couple of guys from the boat club were there to meet me with big smiles anyways. I got a room, a hot shower, directions to the supermarket, a place to store my boat, everything a kayaker could ask for. I had the time, and courage, to practice a few rolls before my shower. I hadn't practiced rolling in a long time, but they came out better than ever, even in zero visibility water. It was one of the best days yet. Today I paddled one town over, to the port people were directing me to yesterday about ten miles on. I needed a short hassle-free paddle after last night’s escape struggle. There was a wind pushing towards shore so I expected slightly larger than usual waves. My boat had been parked for the night up a fat flat river. The wind sent the current upstream. On both sides of the river were shacks that rigged large nets up high over the water, two story buildings with the nets going out 30 feet or more from the second story. On the right side of the river the shacks continued on a rock wall out into the sea. The rock wall had either collapsed from its full height or been covered by the rising sea, because some of the huts were no longer reachable by foot. I read that the sea is rising about one centimeter every three years. As I approached the end of the river, the waves started to get big, turn back big. But I expected* once past the mouth of the river they would calm down. Frequently the sea exhibits odd behavior at the mouth of large rivers. The waves were getting very big, two to three meters. It may have been the steepest huge wave I have ever taken head on. As I climbed the giant the front of my boat went way up while the back was still far below. I feared for a moment that I would be flipped the long way and a pressure in my chest was telling me not to do this again. Then I was over the top of it and my bow crashed down. Out from the mouth of the river the waves were not quite as bad. Still, I was frequently splashed with large quantities of spray or overrun entirely by heaps of breaking waves. One large wave broke while I was half way up it. At first I was shoulder high in crashing water, then sculling desperately on the down wave side not to go over. On my second skull stroke a powerful hip snap brought me upright and saved me from checking for fish underside. The strangest thing about the waves was that they were disproportionate to the wind. The prediction was for five to ten knots of wind, and it felt like less than that. But the waves were the kind that come out only for a special occasions. At least the weather has been warm. On land I followed a beach the whole way. Just behind it were summer tourist buildings. Shops, hotels, and beach clubs closed for the season. The port I arrived at was a huge industrial shipping complex that I could have easily beenlost in, but I was forewarned. I had studied a map of it the night before and knew exactly where to go. The Lega Navale here is a welcoming place with an Internet connection I was able to contact my friends and family on a couch I will now lay down to sleep on. This morning I took my time. I went shopping for food and looked for a place to connect to the internet. After, all manner of people stopped by to visit with my host and be introduced to me. One of them had asked me about fishing and I went to show him my set up only to discover my reel and lure were gone. My reel had been solidly tied to my boat with a quick release clamp. I found the reel,floating in the water not far away. The marine string was torn and the clamp missing. The lure was gone also. A mad thing in the night, perhaps a monster risen out of the filthy harbor, had its way with my fishing stuff. The man who had asked me came back a while later and gave me a new lure as a kind gift. By 1:00 I had left after saying a dear goodbye. My host had called ahead and got me a place to stay in Marina de Pisa, at the Lega Nevale there. I paddled all afternoon at a good clip. I followed a beach with a large forest behind it to arrive in the evening. Oh, and I lost my new lure. If the weather is good and there's still plenty of light: Tell him were the nearest port is. If the day is almost out: Tell him where the nearest boat ramp or dock is and then where the nearest port is. If already dark out and a horrible lightning storm with frequent orange and red double lightning bolts is rushing towards your location, as was the case today: Tell him where the nearest safe place to get off the water is, then tell him about that place not far away with all the docks that all the local boaters use to get on and off the water even though it's not officially a port. After that, if you must, tell him there is a port one town over that he couldn't possibly make it to without getting destroyed by lightning death. DO NOT LEAVE OUT THE FIRST TWO STEPS YOU FIL-ª& !·”?@#+¡¿'?$). This letter has been written in light of the persistent failure of multiple fishermen to adhere to common sense. Thank you for your consideration and for your future assistance to fellow boaters. 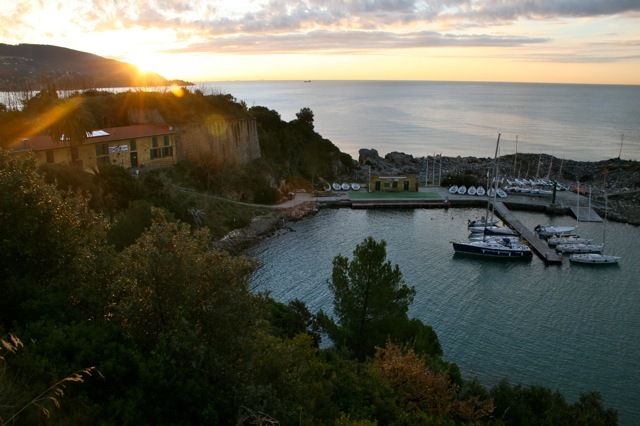 I woke up one town over from Lerici in the comfortable hospitality of the sailing school. I was just across the bay from my boat and the director of the school had offered to give me a lift first thing in the morning. He was punctual and I was fifteen minutes late. I don't like to be late. With a friendly face he invited me onto a large old motorboat and we cut across the bay in much less time than it had taken me to get to the school by car on Friday. I had asked if we could sail across the bay but was told it would take much too long. Aside my boat in the Lerici harbor I packed up my things and prepared for my day. Boththe Director and a nice chap from the Erix boating club watched, chatted, and took pictures. Erix was the boating club that helped me find a place to stay on Friday. My paddle float was missing. It wasn't likely it had been stolen, and sure enough it had been hung up to dry with my wet suit inside the Erix club. A paddle float is a device that attaches to the end of my paddle turning my kayak into an outrigger. I have used mine once to assist me in climbing up an extremely high pier. Just before I was ready to leave, Chap gave me an envelope containing support from Erixfor my trip. Thank you club Erix for your involvement. May your members successfully pursue their own boating dreams. 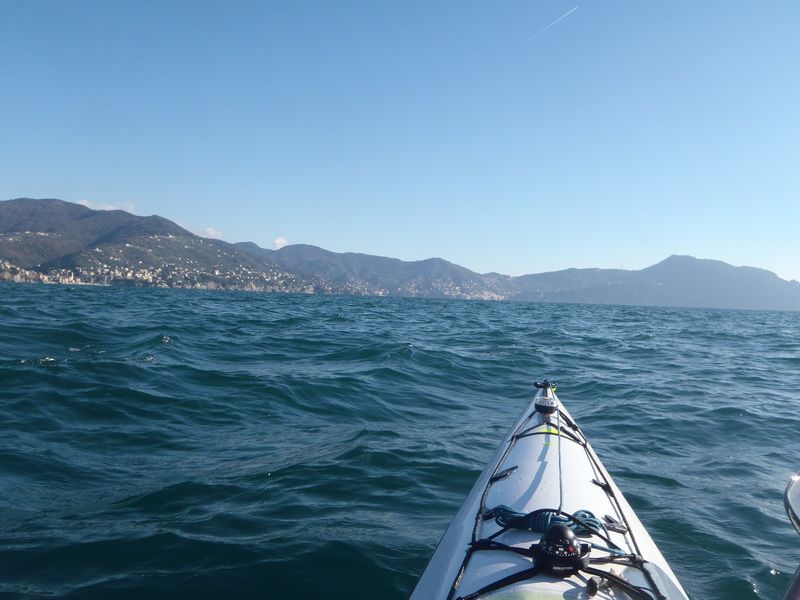 From Lerici I paddled east, leaving the bay with the last of the coastal mountains on my left. From the edge of the bay of La Spezia the land fell back to the north and became suburban beach as I continued straight on to Viareggio. I was a couple miles out, well into the middle of nowhere, when a fisherman saw me in the distance. He zoomed by to stare without saying a word. The day was sunny and warm. Plenty of clouds were in the northern part of the sky, butthe southern half was mostly clear. There was a soft headwind and a current working against me, but the water was flat and the world was pleasant. The sea can be one of the most devastating places, and one of the calmest. Today was the latter. I could see a sailboat moving along fairly close to the coast. Other than that and the gawking fisherman, no one else was out there. The sun set. I pulled in my fishing line and turned on my lights by extending my paddle to the ends of my boat. I had forgotten how pleasant night paddling can be, when the sea is soft and the air soothing. I ran out of drinking water, but there wasn't that much left to go. Usually, three liters is enough. A buoy with a black flag waving from it was suddenly on my right, scaring the willies out of me. But soon enough I had my willies back, only to lose them again when the light reflected oddly off of a small swell. I got a grip on them and kept them in check for the rest of the evening. The shore was gradually approaching and the red and green lights marking the entrance to the marina finally passed me on either side. I had arrived. The Director had kindly arranged for a fellow here to host me in his boat for the night. I was looking for pier seven, I thought. On pier eight there was a fisherman and another guy next to him. I wondered how many people had paddled from Lerici today. I felt like I had put in a solid day’s work; to think that I was one of many was disheartening. “Umm, sort of.” I answered. I had hoped to paddle to Athens, but I won't make it in time to be back in school for February 20th. My initial delay in getting started lost me a month of long days and left me in the north for bad weather, slowing me down even more. So I had not just a host, but a welcoming comity. A couple and their daughter had me pose for pictures with them as soon as I got out of my boat. It was the girl who heard me ask for, and got for me, some water. She is my new favorite person. I showered, ate, and slept in a small cabin of a beautiful sailing boat with a wonderful heater. The space was small and I was too tired to open up my sleeping bag. A couple of times in the night I would wake up and think about it. I would sit up just a little, hit my head on the low ceiling, and go back to sleep. 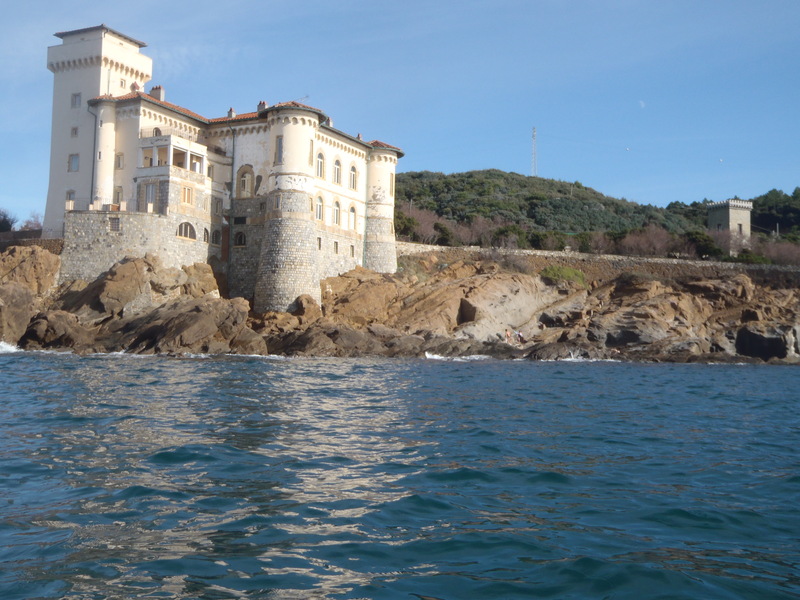 Friday morning I paddled from Portovenere to Lerici crossing the Bay of La Spezia. The weather was ugly, rain and a 15 knot South East wind, but with only a short distance planned I wouldn't need to worry about getting tired. I could handle the weather just fine. I had word that their was a boat club, Erix, in Lerici and I was counting on them to let me stay there for the Sabbath, which is why I chose it as my destination. I had asked one of the boat clubs I had stayed with previously to call ahead and set me up. But I arrived and it was not to be. They couldn't let me stay in their club house or in one of their many boats for insurance reasons. The man who had told me this was happy to show me a place next to the building where he said I could sleep since bums frequently do. I hung around and chatted amicably with the members of the club and brought my situation to there attention. People where annoyed on my behalf and a group of them began talking in Italian about my situation. After some time of debate, phone calls were made and a decision was reached. The sailing school one town over would be happy to host me. 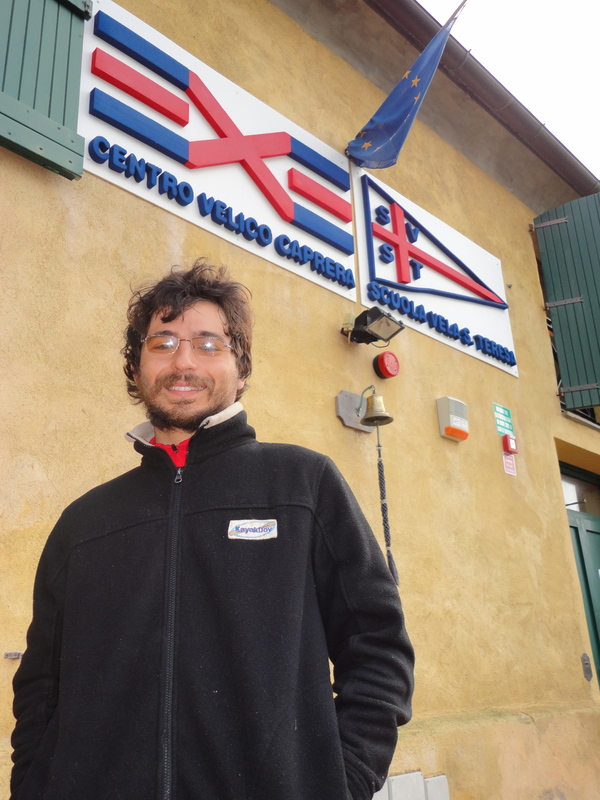 Centro Velico Caprera, one of the oldest sailing schools in Italy is a great place run by kind people. The director who I met Saturday morning told me that it's one of the goals of the school to help marine travelers such as myself. I got a warm bed and a shower. While I stayed here I was delighted to be a guest not only of the school, but of the current program. Some 30 people, mostly children of all sizes, were having a winter sailing session over break. The air was constantly filled with the sounds of happy youths, and that along with the blessed radiators warmed my heart. Last night I was invited to a friend of my host's to make use of an internet connection and shower. I chatted amicably with the 72 year old kayaker on all manner of subjects including his grandkids, his kayaking trips in the area and “What? You've never caught a fish?” He asked me in disbelief. I went about my business on the computer. I can't say that his words, undoubtedly meant to encourage, had a heartwarming effect. 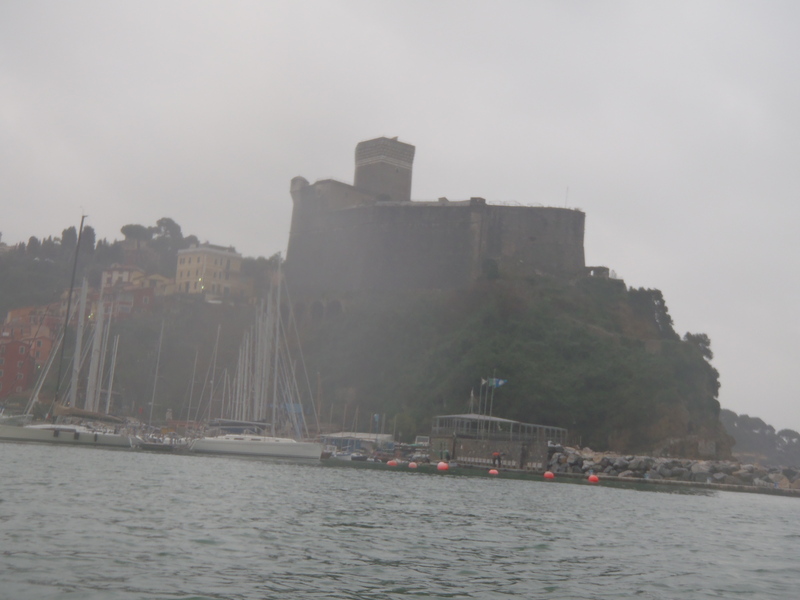 I had hoped today to paddle to the tip of the Five Villages area and then cut across the bay to Lerici. I set out under a light drizzle and low visibility. The mountains above me were steadily growing in sheerness and one in every three or so was dotted with a quaint village. Some of the villages were right above the water while others were much higher up,sitting on cliffs that descended hundreds of feet to the waves below. A boat ramp would invariably snake down the side of the rock to the water. Kayaks and other small watercraft would be near the bottom. Just past a village, with the sea and the wilderness around me I passed over a thick underwater rope to nowhere. Maybe it washolding a buoy in place out at sea, or had long ago lost its purpose. The wind had begun to pick up a little and it's always neat to watch the waves interplay with the rocks. It's much more exciting to paddle close to shore. My boat was pulled to the left, and then my fishing line reel snapped out from under the bungees. 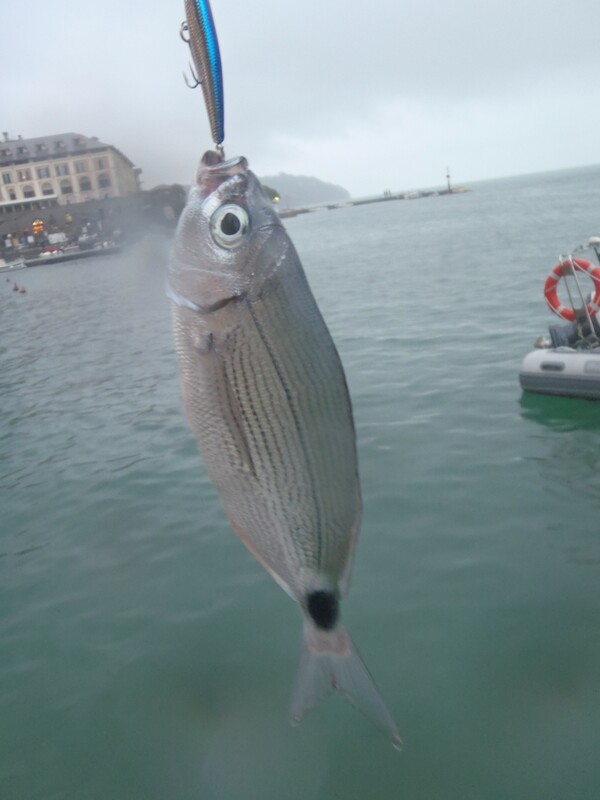 It was still attached by a cord; I was extremely excited to grab it and release the cord so I could start reeling in. This had never happened before, and I dared hope that I had caught a fish. I believe I was saying “Holy shmoley. Holy shmoley. Holy schmoley.” Through most of the process. I would reel it in a little and feel the pressure against me. Whatever had the other end of my line was fighting me in a way that said “You haven't caught a rock this time.” When it was pulling hard I let it pull, and when it eased up I reeled it in a little more, recalling the strategy I read about in The Old Man and the Sea. I didn't know if the fish was pulling me or the wind, but I was moving towards a rocky area where I would have to abandon the beast if it came to it. Sometimes I would let some more line out, just to make sure the lure was properly swallowed, but always I would get back to slowly bringing it in. The beast was now pulling more down than away from me, and then I could see the large rope I had passed over earlier. And then I realized that I had caught the rope. The excitement wasn't over, I had to save my lure. There were eight Euro at stake here. If I had to, I could always cut the line; the lure had the rope firmly. It was important to me that I not capsize while fooling around with hooks and fishing wire so I tread with caution. I had my pliers out and was prepared to cut the hook, it would be much cheaper to replace a hook then a lure. Finally I pulled the old slimy green rope up on my deck and studied the thing closely. I cut away the rope from around the hook and my lure was free. Free to catch another rope another day. Free to get caught in my spray skirt as it did right away. Free. Aside from the villages, there was nothing but the woods and the rocks. At times the rocks took on many different colors, reds and beige and black intermingling with each other to give way to the green woods at their tops. And then above that another final rock white peak would look out over all. I could not take many pictures because around noon the wind picked up and turned into a solid headwind. 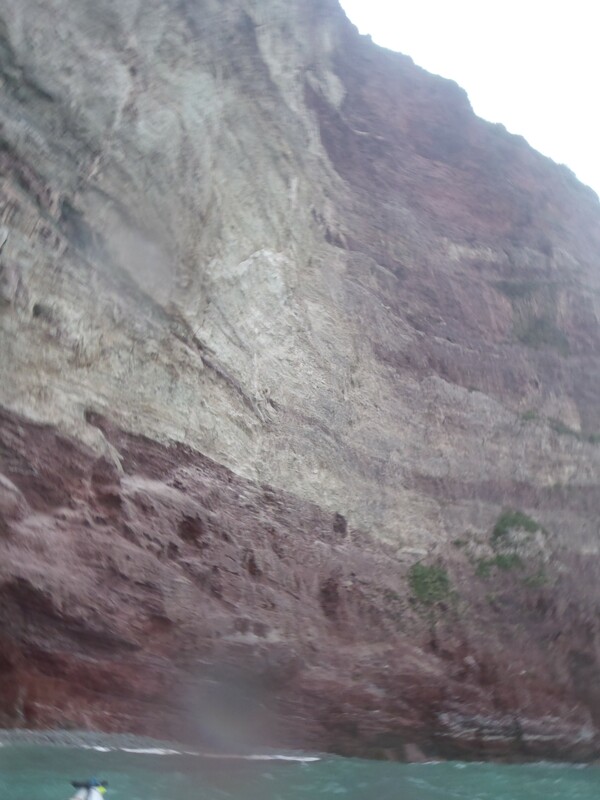 I stayed as near the cliffs I could to escape the full force of it, but this provided its own set of challenges. The headwind continued to pick up and the time came when I decided that I would get offthe water at the next opportunity. Shortly after I made out a house halfway up the cliff and what might have been a way down to a rocky beach. I studied the surf for a while before moving on. The conditions weren't so bad that I would risk my boat in a tricky landing. Later I saw a better beach, and above it five or six abandoned shacks that might have been from the beginning of the last century. I didn't have enough food or water to camp out, so I paddled on. The mountains grew more and more impressive, sporting exciting looking sea caves thatwere larger and deeper than any I had seen yet. At the end of the peninsula I was traveling along I would find a port. Just after that were a couple of islands. I didn't know if the mountains ahead were islands or part of the mainland. I hadn't seen a village for a while when I could make out a huge castle above me. Wallsalong the top of the cliff ran to an old church above an outcropping from the sea. It was an impressive fortification. Around the church what I thought was a small gully turned out to be the sea before the first island. I could make out the port. The water between the island and the mainland was not rough as I expected, but a flat and safe harbor. My wild ride had come to an end. The port had a couple of emergency rafts, a few small fishing boats, and a line of sleek sailing racers that looked set to begin a race around the world. In the port’s offices I scored the code to the shower room and an invitation to sleep on the floor. I went back out to my boat and pulled it up onto the pier as I usually do, and saw my fishing line was caught on something. As best I could make out, it was hooked either to the emergency life boat not far from me, or more likely, the life boats anchor rope. I leaped from the pier into the life boat and walked to the stern as I continued reeling in. I could make out the anchor rope and my line went down to it. There was something shiny down there too big to be my lure. A fish was there, and it was hooked on my lure. The line was wrapped around the anchor rope many times, but not caught on it. Some time in the craziness of my day I caught a fish and didn't notice. I pulled it with me who knows how far, and when I finally stopped, Samson made one last wily effort to flee only to find himself getting pulled closer and closer to the anchor rope. There he gave up, for when I found him he had no strength. I gutted, scaled, and named Samson. A great creature turned into a tasty treat. The water was flat, at times glassy. I could see in it the clouds and the mountains swaying back and forth. I could see in the east a place where there were no clouds, a place where the sun showered its glory on the sea. It looked like a good place, a far away place. Closer and to the south there was a small opening in the cloud cover, and a great ray of sun poured through, as though angels might descend in the heavenly light any moment only to discover whether or not they could swim. 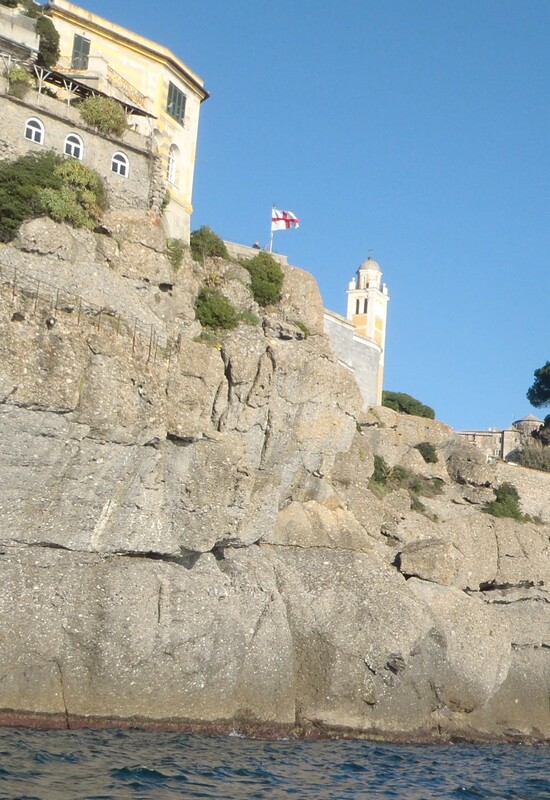 Towards the end of my day I was paddling along an exciting cliff face, made mysterious bythe occasional sea cave. There were several other fishermen on small motor boats in the area, this could have been a good sign, as in “This is a good place to try your luck Dov.” Or a bad one “Ha ha, you have no chance of competing with real fishermen.” At one point I saw a bunch of fish splash from just beneath the surface, so I circled over the area. There's no way the fish didn't see my lure. Cloud cover aside, it was a great day to kayak. I pulled into the small port inMonterosso. A few fishing boats and a lifeboat shared the small harbor with me. One of the sides of the inlet had a low wall and I pulled up aside it to get out. It was an easy exit, but after a good day’s paddle there’s nothing like a series of death groans to give satisfaction while debarking. “You kayak from Barcelona?” The man asked me. What man, where did he come from. And could he tell how far I had come just by the quality of my groans? No, the boat club I had stayed with the night before knew I would be coming here and had called ahead. A former Olympic paddler who now runs a hotel here was happy to let me stay in one of the rooms free of charge. This morning I woke up in a house surrounded by the feel of grandparents. Not my grandparents, but somebody's, and the house felt like it. Today some sneaky little punk stole the sun some time before dawn. God, in an effort to buy time while he was looking for it, threw a sheet of clouds over the sky hoping that nobody would notice the absence. Having recently spent a good deal more time under the heavens than most people, sensitive to the slightest abnormality, I have not fallen for this simplistic ploy. It was a cold dark day, if day you could call it. I trailed my new lure, hoping that god would be too busy looking for the sun to notice I was fishing. Maybe today I would catch something. But it would seem that the force against me is greater then divine, no fish for dinner tonight. I paddled to Sestri Levante. My host from the night before told me that while I was at sea he would contact the paddle club here and ask them to meet me at 3:00. The distance was not far, though it would have been to the next port, so I was there at two. And nobody met me at three at the spot I had been told to wait. But at 3:15 as I was ready to move on, I saw another paddler out on the water moving at a good clip. That was odd, I thought. You'd have to be crazy to be out paddling on a day like today. I called to him, but he did not hear me. I followed him and eventually got his attention. Yes, he was looking for the crazy kayaker from Portugal. “Barcelona.” I said. It was wonderful to meet him and he seemed happy to meet me. Tonight I'll sleep in the clubhouse of the Leaga Naval Sestri Levante. I met a bunch of them and they're super cool folks. I was slightly surprised when I stepped out of the shower into my bedroom, and found a class on navigation beginning there. This morning I searched Nervi for a chart, a toothbrush, and gas. I have now left my old chart. I am almost out of gas for my stove, and I had lost my old toothbrush in Switzerland. I found a toothbrush and got directions to a store that would sell me gas. The gas store was closed since it's Monday. The Marine shop which I hoped would sell me a chart was closed for the same reason. “Monday is a reason to be closed?” You might ask. I don't know, but it sure makes shopping a task. 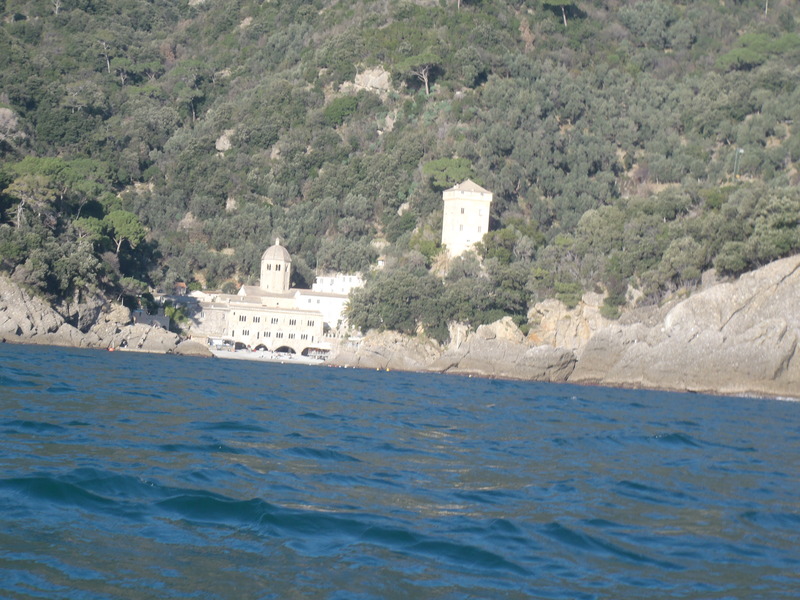 Today I paddled from Nervi to Rapallo. The sun was out, and I basked in it. I haven't paddled under the sun in a long time. The mountains where bright and the hills were alive with the sound of music. * It was a nice day. I paddled around a large scarcely inhabited peninsula. Once on the outside of it the headwind picked up, but itwas not intolerable. Large cliffs overflowing with green woods shot above. Interesting stone formations were everywhere. Atop one rocky peakthere was an old tower with a great view of the sea, and shortly after there was a tiny village at the base of a mountain. The buildings in the village must have been very old and I got the impression that the only access to this place was sea access. Later I saw a goat. The next tiny village, maybe five buildings including the church and the castle, was flying a red cross flag and had a few tourists wandering about. What's that? More about the goat? OK.
At first there was only one, a white fellow with mighty horns and a wise face. He had a beard that looked kind of like mine only a lot better. I imagine that this was no ordinary goat, but a goat king. Lord of all the goats of the peninsula. The other goats that appeared one at a time afterwards were neat looking, but none so impressive as the first. 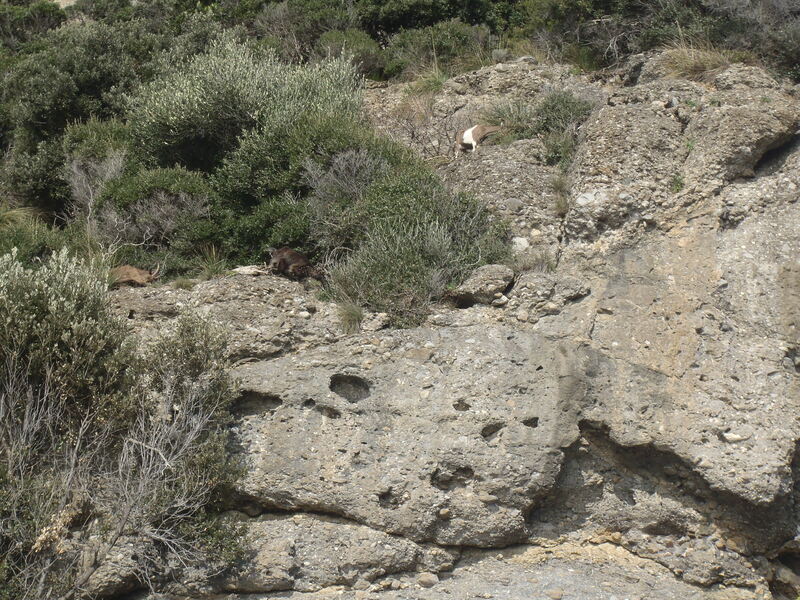 They were climbing along the cliff face and eating from the grasses and plants growing from the rocks. I noticed them when I stopped for my own lunch and was staring at the cliff, only to realize that there was a goat in front of me staring back. Paddling around the second corner of the squarish peninsula I fought against a wall of wind, and once past it the wind calmed a little but the surf became fairly rough for a while with waves frequently spilling over my deck. Finally I was approaching the town of Rappalo. I kept my eyes open for the kayak club. I had a phone number to call when I got there. The number was given to me by Banjo, and whoever was at the other end was expecting my call and would hook me up with a place to stay for the night. I thought I saw another paddler in the distance, it looked like another row boat of the sort I had seen the day before but I wasn't sure. The boat disappeared behind some rocks, not to reemerge. I asked a fisherman for directions to the club. He was sure it was somewhere around here, but didn't know where. I approached a port, and from around the corner came two kayakers. Their boats where small and unadorned. The sportsmen were a couple in their golden years who spoke not a word of English. They were headed to the kayak club, so I followed them back the way I came. They showed me to a changing room and when I was done helped me move my boat to a safe place. They invited me to sleep over. * I don’t think he means that literally. ~ ed.